I love bringing English Garden materials into a home. The mix of textures makes things so much more interesting. 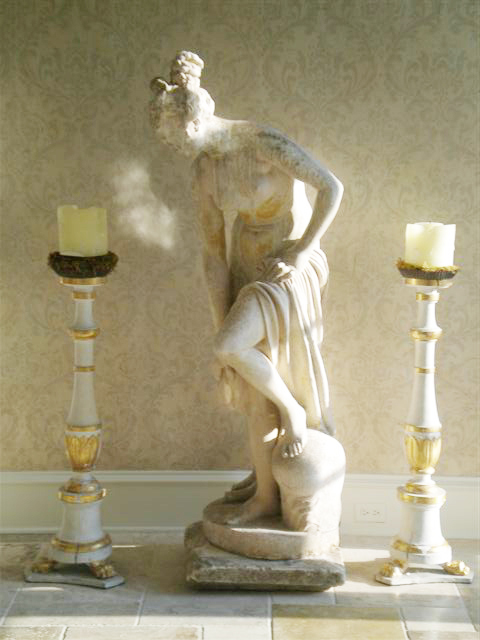 Here is a wonderful 19th century garden statue of Venus. I bought it from an English estate. The Torchieres are 18th Century Italian. Torchiere comes from the french word torche. Light. These candle sticks were used in a church to light the alter. The finish is casein and has water gilt accents. The paper that you see behind venus is actually tea paper that was gilded with silver leaf and the design was silk-screened on top of the paper.